Phoenix MT equipment provides geophysical data for a wide range of crustal research applications. Major uses include identifying subduction zone boundaries and determining the thickness of the earth's crust at a particular location, such as the Himalaya region of the Indian sub-continent. Phoenix MT equipment can measure periods as low as ~50,000 seconds, permitting ultra-deep geophysical investigations to the bottom of the earth's crust (100 km to 150 km below the surface). 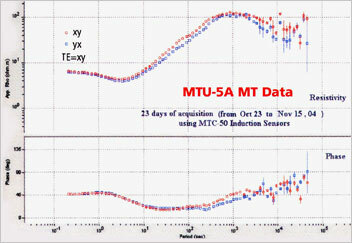 Dr. Alan G. Jones, Senior Professor and Head of Geophysics at the School of Cosmic Physics, Dublin Institute for Advanced Studies, has used MT extensively in his studies of plate tectonics. from a long-period test by the University of Alberta. A subduction zone is a boundary where two tectonic plates collide and, because of differences in density, one dives beneath the other. This occurs frequently where an oceanic plate meets a continental plate, but also when continental plates collide. The denser and thicker plate is forced underneath the less dense plate. 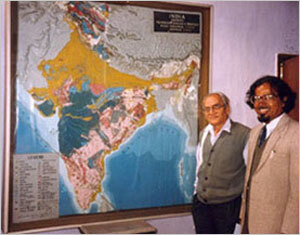 Indian geoscientists beside a geological map of the Indian sub-continent. The subduction zone where the sub-continental plate is colliding with the Asian plate has created the Himalayas, and is being investigated using Phoenix MT equipment.